I have only recently started playing the Dungeons and Dragons role playing game with my friends. Sure it starts off innocently enough, raiding orc caverns and saving innocent villagers, but a few drinks later and someone in your party is rolling a D20 to seduce an attractive dwarf priestess in her bed chamber (Whether this person was me or not…I will neither confirm nor deny). That is what Your Highness feels like, a Dungeons and Dragons game gone horribly awry and despite some short comings I found myself laughing to the point of tears. 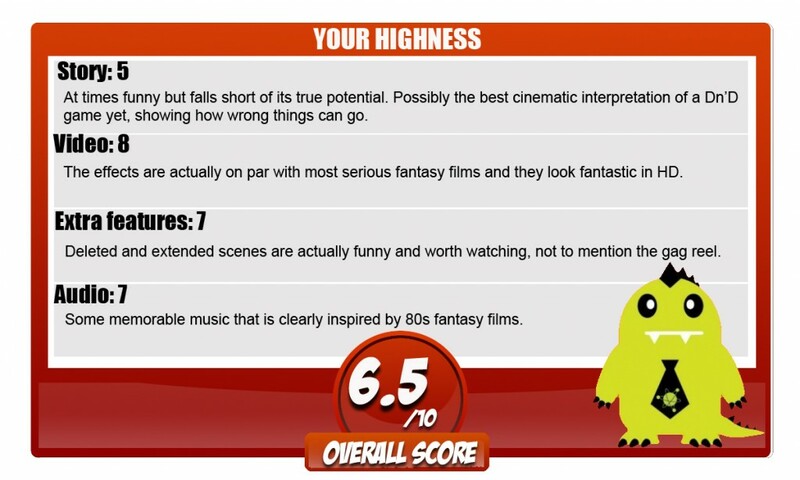 Clearly taking its inspiration from fantasy classics like Conan, Krull, and Lady Hawk, Your Highness is aimed to please fans of the fantasy genre. So what about everyone else? 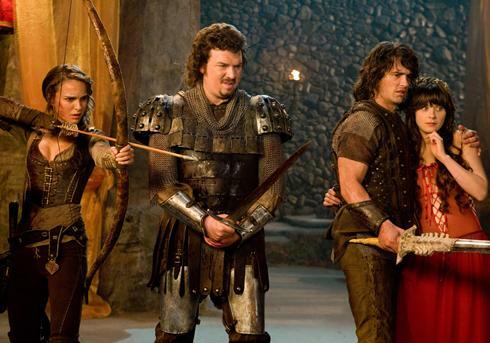 The movie begins with Prince Thadeous (Danny McBride) being hanged for having sexual relations with the Dwarf King’s wife (I guess his role was successful). After a daring escape shown through some really cheap animation they return home, where the King is displeased with his son’s incompetence. Fabious (James Franco) on the other hand returns victorious after slaying the Cyclops of the evil wizard Leezar (Justin Theroux), even rescuing a beautiful virgin named Belladona (Zooey Deshanel) from the wizard’s lair. Since they have fallen completely in love they wish to get married immediately. But if there is one thing that gets an evil wizard’s piss in a boil, its stealing his virgin. Leezar crashes the wedding and steals Belladona back to fulfill an evil prophecy that would grant him unimaginable power through a ritual known as- I am not kidding- “The Fuckening”. Much to his dismay of Thadeous he must go on a quest with his brother to save her, otherwise he will be banished. They must travel a long and dangerous road filled with forest nymphs, a minotaur, and a child molesting muppet, to save Fabious’ bride to be. Even with the assistance of the blood thirsty Isabel (Natalie Portman), will they get to Leezar in time to prevent the destruction of the entire world? The only thing more head scratching then casting an academy award winner like Natalie Portman and an academy award nominee like James Franco as supportive characters, is casting a lackluster actor like Danny McBride as the main protagonist. When being among such a high profile cast, he sticks out like a sore thumb. I wish I could have seen more of Franco and Portman (or at least more of Zooey Deshanel since she is hardly used). The scenes that do have James Franco and Natalie Portman are fantastic. Prince Fabious is the epitome of the stereotypical Disney prince, minus a proper singing voice. He is noble, courageous, and as corny as you possibly imagine. A cunning warrior with a heart of gold, even loving his self centered brother despite his obvious flaws. Watching Natalie Portman take a backseat from her more serious roles as of late is refreshing. She is the revenge driven Isabel, who vows to kill Leezar for the murder of her brothers. Of course one of the film’s selling points is that you get to see her in a thong, but also hearing her spew vulgar dialogue like nobodies business is a real treat. plus...you get to see her in a freaking thong. If anyone steals movie it is Justin Therox as Leezar. His over the top performance and his funny one liners make the villain the most memorable, and likable, part of the movie. When he is on screen he chews up the material and I wish we could have seen more of him. Of course this movie is supposed to be silly and filled to the brim with vulgar humor, but sometimes a joke feels pointless and falls flat on its face. For every hilarious moment that had me on the brink of tears, there would be 3 I would stare blankly at. The good moments stand out and will have you chuckling well after the film is over, the rest will be forgotten far too easily. The most impressive, and unforeseen quality, of Your Highness are the special effects. They actually look similar something you would see in a serious fantasy film like Lord of the Rings or Harry Potter. They even used practical effects for a very realistic looking Minotaur, who stars in the most memorable scene that I will not spoil here, but that I guarantee will have you groaning and laughing at the same time. Usually deleted scenes are things I believe should always remain on the cutting room floor, but the ones provided on this blu-ray are either completely hysterical or completely grotesque, all completely awesome. The gag reels are pretty funny too given the movie these actors are working on, I would never expect them to take things too seriously. The scenes with Natalie Portman goofing off are the highlight of these. The only thing that really bugs me is that I get a digital copy, yet no dvd? Lame. A simple plot but with some fun performances, hilarious moments, and some exceptional special effects, make this a highly enjoyable film for anyone who is a fan of the genre. But Even then it still falls a bit short of what it was capable of accomplishing. Fantasy nerds can watch this and walk out with a certain satisfaction, but it certainly could have been much better. Fernando Caire is a cosplayer, an artist, an aspiring Video editor, a prop builder, a writer, and a cinephile, with a PHD in awesome. He loves cinema, both good and bad. You will catch him once a month with a group of like minded masochists who endure 8 hours of the worst movies in cinematic history...for fun. He loves video games (shows off his "team Ps3" shirt) and loves writing about them when he gets the chance (though the only ones he ever received for review have been bad). The San Diego Comic Con is what he considers to be his once a year vacation. You will find him in line for Hall H bright and early and if you are between him and any kind of free swag...God help you.